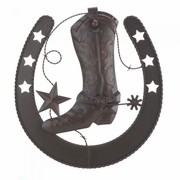 Add some Western style to your wall with this cool cast-iron cowboy decor. A classic cowboy boot with spur rests inside a large horseshoe, surrounded by stars and a little bit of barb wire. Metal, 14.2" x 15.8"